After I pinned this idea last week, it got repinned over 300 times. When teachers rally around an idea, attention needs to be paid to it! 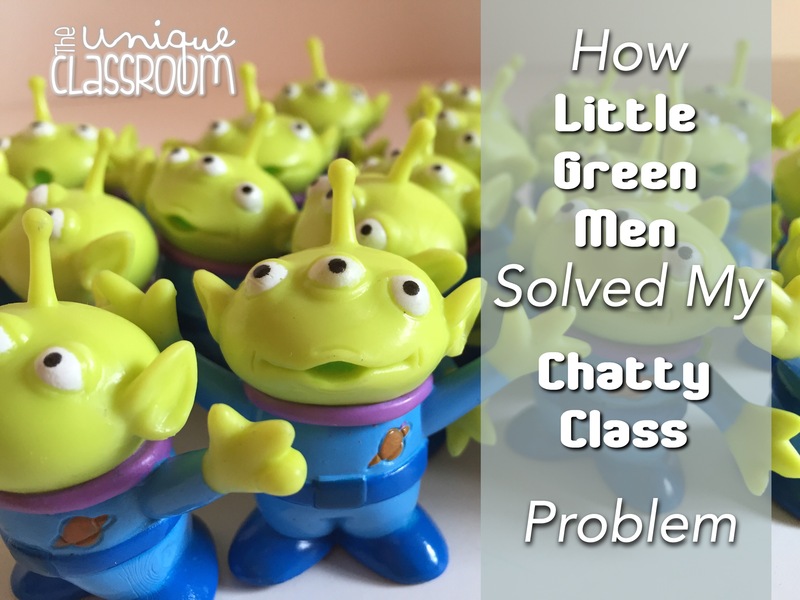 I’ve been struggling with a very chatty class this year, and have tried everything, to no avail. I typically use call and response techniques, explicit teaching of rules in September, natural consequences, brain breaks, and above all, consistency in my classroom. “Give an inch and they’ll take a yard.” Sound familiar? That’s been my struggle. I like to incorporate a bit of novelty to keep things fresh, but this particular group has some difficulty regulating their impulses. A simple, quick, fun GoNoodle video becomes complicated, time-consuming, and frustrating for me when I try to settle them back down. Call and response can easily spiral into a gaggle of giggles. And although they generally work initially, keeping my students’ attention can be difficult. Brain gym exercises must consist mainly of focusing rather than energizing skills. Energizers? I have to be careful with how I implement them. A lack of energy is not a problem! We do a LOT of mindfulness techniques. But no matter what I do, all of this takes time. Something of which I don’t have endless amounts. Going into this year, my tenth, I felt rather confident in my classroom management skills. Having taught special education for eight years, I’ve collected a plethora of techniques to use with a variety of students. Being able to manage an entire class of kids who have attention issues, I might even say I was cocky. It only took one class to remind me that no one has all the answers. I have used Class Dojo (another fabulous find on Pinterest! ), but because this class was such a chatty group, taking points away from individuals just wasn’t efficient. Plus, my students need to SEE their progress as a reminder of their behavior. Beat the Teacher? Nope, Beat Zurg! When I saw this idea on Pinterest, it caught my eye right away. 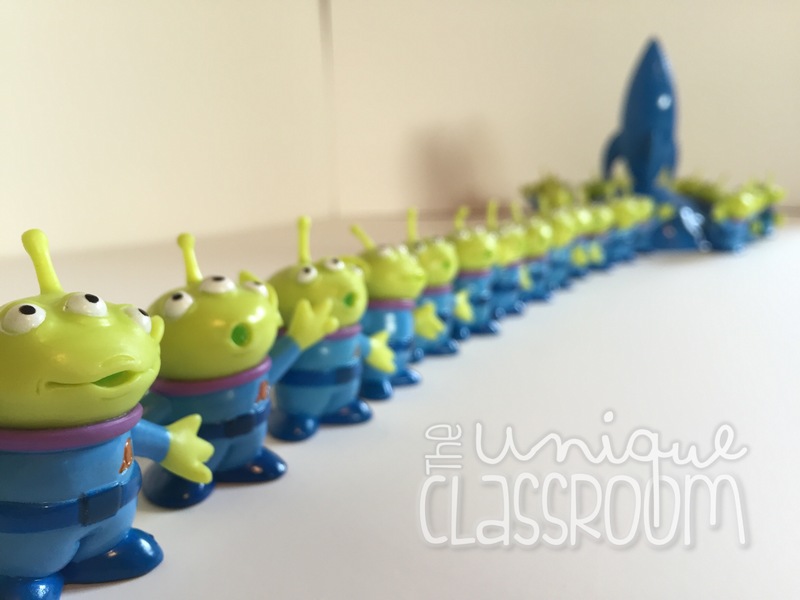 The changes I made were to take away the “teacher versus students” concept, and add The Little Green Men and Zurg. The idea is to always give kids time to settle down by counting back from five. By the time I get to one, my students should be quiet and their attention should be on me. 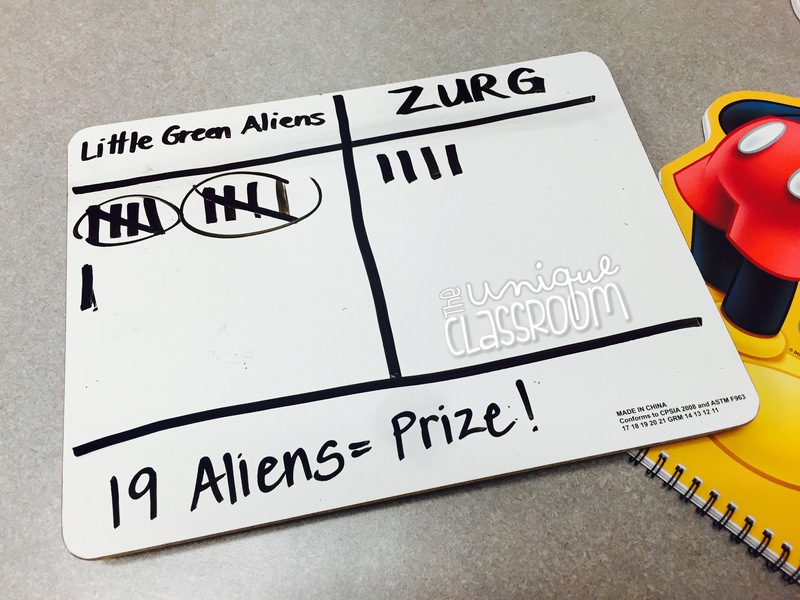 If everyone is silent, the Aliens get a tally. But if anyone is still talking, Zurg gets a tally. That’s where the Little Green Men came in. (How adorable are they??). 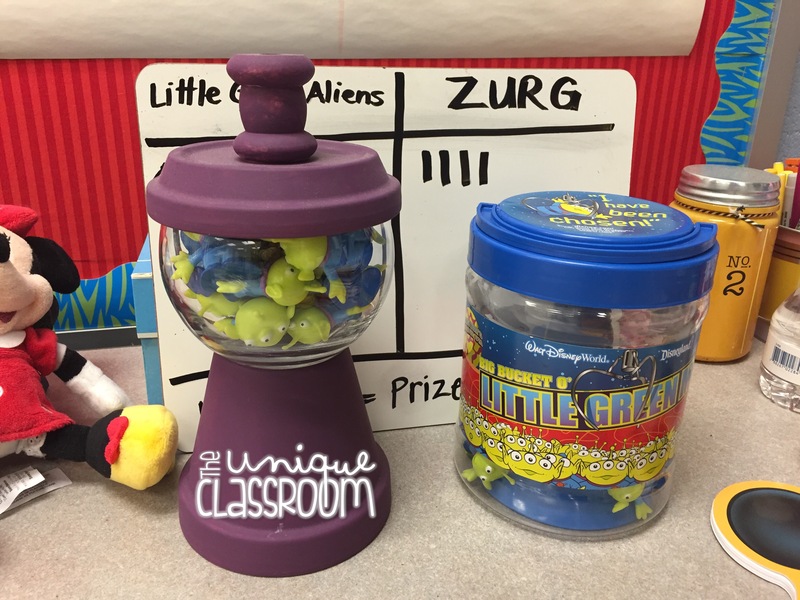 I added the Aliens after I was given this tub of Little Green Men by a sweet teacher I met on IG through a Secret Teacher event promoted by Chris from Famous in First. 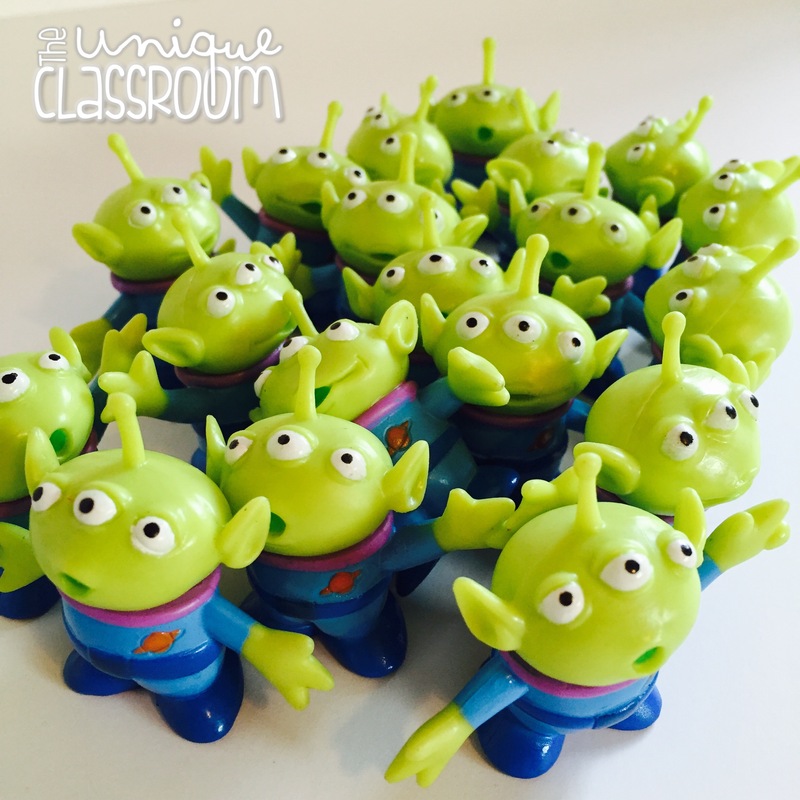 I placed 19 Aliens in a candy jar given to me by a former student. 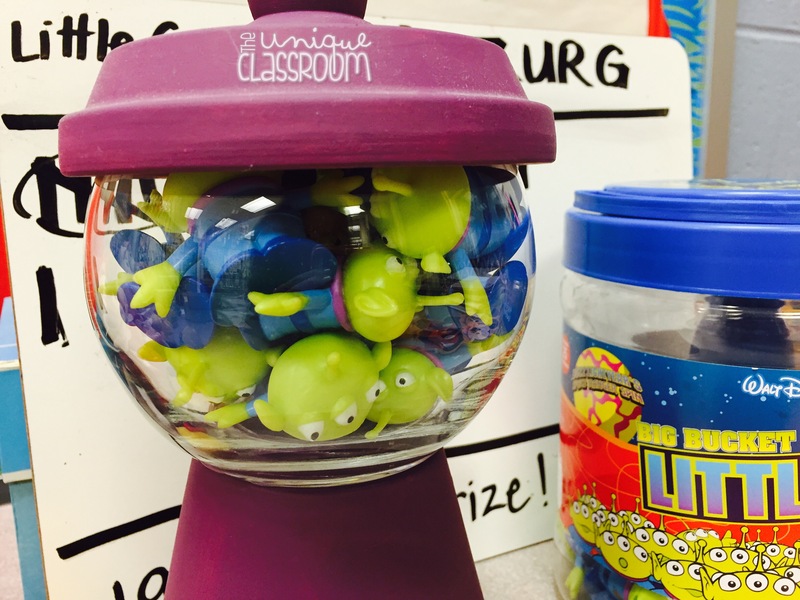 For each group of five tallies that the “Aliens” (aka my students) earn, the Claw (me) removes one Alien from the jar. For each group of five tallies that Zurg gets, an Alien is replaced in the jar. After all 19 Aliens have been removed, the class earns a pajama and hot chocolate party! On our first day, two aliens were removed, so we’re headed in the right direction! I’m not kidding when I tell you that I want another pajama party just as much as they do! Previous Post Have You Tried a Book Pollyanna?